A team created by President Lyndon B. Johnson and led by Otto Kerner, Governor of Chicago, to investigate the causes behind the deadly riots and violence that took place in 1967 in various inner cities in the U.S. 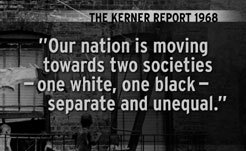 The Commission published its findings in the Kerner Report in 1968 and found that the violence was caused in response to the development of two divided and imbalanced societies, comprising of whites in the suburban areas and the blacks in the urban areas. Following the Great Migration, whites sought to move outward from the cities and thus, blacks were forced to remain in blighted communities in the city centers. This angered the blacks because their neighborhoods were often ignored for development and opportunities at success dwindled while white communities continued to be supported by government policy and other financial institutions. Furthermore, the anger of the blacks was heightened with urban renewal, as more of their population was displaced. Clearly, the government wasn’t doing enough, if anything at all, to rid them of this injustice and so the blacks took their rage to the streets in the form of violence to call attention to the prevalent oppression. As a solution, the Kerner Commission proposed that the federal budget be increased to assist the communities of concern, but the U.S. was at war with Vietnam, thereby influencing President Johnson’s inability to implement it.